Need this item quickly? It can be delivered to you within 2-3 days within UK. Details. Consuming 9 watts of power, this COB GU10 LED Bulb manufactured by Mirrorstone is the perfect replacement for any 80W halogen GU10. Your savings can start imminently as these can directly replace your halogen spotlights. Each individual 9W GU10 Bulb comes with one single COB LED. This single COB chip provides 9 Watts of power, making it the right equivalent for any 80W halogen bulb. With a brightness output of 860 Lumens and a beam angle of 60° the 9W COB replicates halogen spotlights better than most LED GU10's. The 9W GU10 LED Bulb is available in two colour variations, Warm White and Cool White. Warm White (3000k) is a soft white that is similar to the colour that you get with old style halogen spotlights. A general rule of thumb is that warm white is used in living rooms, bedrooms and dining rooms. Warm White is also recommended in case of any rooms that have a more traditional decor to compliment the setting well. The alternative to the Warm White is Cool White (6000k). Cool White is a sharper, whiter white. Generally Cool White is used in bathrooms and more commercial installations such as offices and warehouses. Opposite to Warm White, modern designed rooms will suit a Cool White light more. The perfect replacement for the popular Megaman 614640 14W Energy saving GU10. Review the specs against our 9W COB bulb and see for yourself exactly how close they are. Using up to 90% less energy than your halogen spotlights, your lighting bills will drop dramatically whilst still maintaining the same brightness level. This massive power reduction results in a cooler running temperature and a lifespan of up to 50 times longer. These cost reductions over such a large amount of time of over 10 years make LEDs a sure choice for your lighting solution. 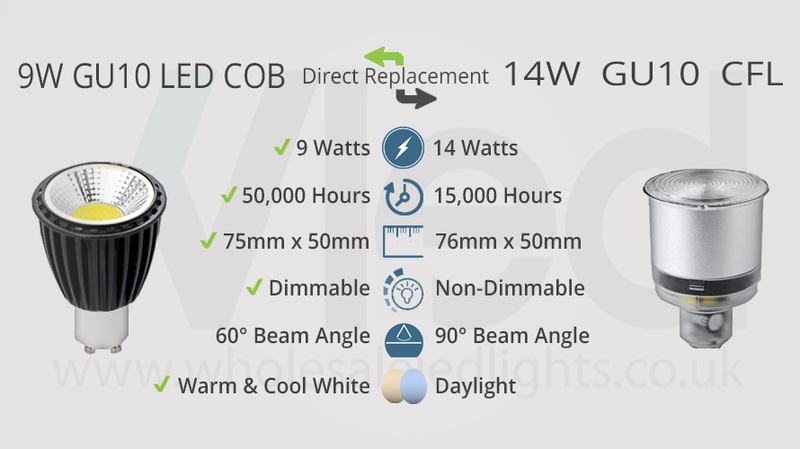 If you're looking to get bulk, 10 or more 9W COBs then you can benefit from volume discounts on the spotlights. You can also apply any of the discount codes which are running at the time so you can achieve up to 25% discount off of your order. You should also know that these 9W GU10 LED bulbs can be shipped for free in case your order is over £40. All purchases do come with our 28 day refunds and exchanges policy, whilst any further unlikely issues are covered by our standard 2 year replacement warranty. This is extendable to 5 years at no extra charge - all you need to do is fill out our extended warranty form within 90 days of purchase, and we'll let you know once it's active! If you have any questions on the warranty, returns procedure or anything else please feel free to contact us on 0116 321 4120 or e-mail us at cs@wled.co.uk. Incredibly bright - brighter than a 50W halogen bulb. Amazing light output at just the right intensity for desk work (dims well when needed). Simple to install in an open fitting but longer than a standard GU10 so would be tight in a recessed fitting. The bulbs are larger than most but they are also very bright. I am really pleased with them. A very good lamp, good light output and colour rendering.